The Aboriginal (Bama) people of the Guugu Yimithirr language group have inhabited this area for thousands of years. The area was first put on the map in 1770 when Lt. James Cook beached his ship the HM Bark Endeavour, and tethered it to a tree in the mouth of the what was to be named the Endeavour River. Lieutenant James Cook needed to carry out urgent repairs after coming to grief near Cape Tribulation on the Great Barrier Reef. The tree was replaced many years ago with a commemorative stone and plaque where the Endeavour was moored for several weeks. A walk along Cooktown’s main street provides an introduction to the history of our town. Cooktown Waterfront - opened in June 2018, the Cooktown waterfront area offers visitors a children's splash pad, fishing platforms, outdoor exercise equipment, grassed areas, BBQs, viewing platform, drinking fountains and public toilet facilities. 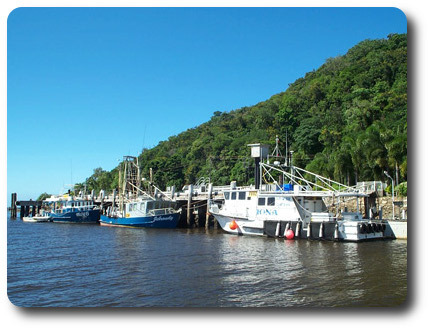 Fisherman’s Wharf – once one of the busiest ports in Queensland during the Gold Rush days, is now a popular meeting place and fishing spot for tourists and locals. Fishing boats, cruise ships and other vessels dock here. Mick the Miner Statue – in memory of the Palmer River Gold rush. The Queen’s Steps – made for HM Queen Elizabeth II for her visit to Cooktown in 1970 to open the James Cook Museum. The Milbi Wall – depicts some of the local history from an Aboriginal perspective. Stories of the Rainbow Snake that created the Endeavour River, the coming of the first Europeans, the cultural clashes and hardships of the early days of Settlement to the Second World War and the triumphs of Aboriginal people today. Jacky - Jacky Store - was built in 1886 and was a general store for 100 years. James Cook Statue – marks the site of the Re-enactment of Cook’s Landing, which takes place every June. James Cook Monument – commemorates Cook’s landing on 17th June 1770. 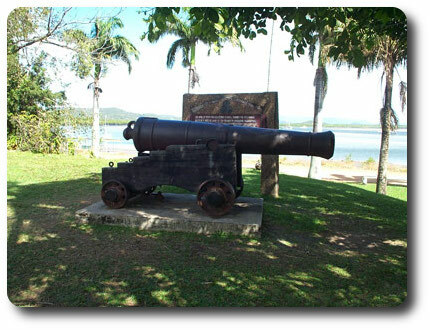 Cannon – dating from 1881 and given to protect Cooktown from Russian invasion. The Cairn – where Lt. James Cook beached HM Bark Endeavour in 1770. James Cook Historical Museum – is situated on the corner of Helen and Furneaux Streets and regarded as one of the best regional museums in Australia. Originally built in 1889 by the Sisters of Mercy, the Convent of St Mary was a Boarding School until World War II. The Old Railway Building – now located next to Anzac Park was part of the original railway station in Adelaide Street. The rail service ran from Cooktown to Laura between 1885 and 1961. Cooktown Creative Arts Association now occupies the building, and a superb range of arts and crafts are displayed and sold here. Mrs Watson’s Monument - erected in 1883 in honour of the determination of this pioneering woman. The family established a home on Lizard Island. While her husband was at sea, she and her Chinese servant and infant son were attacked by Aboriginal men horrified to find a woman at their sacred site. They escaped the island in a large boiler but all perished on another island due to lack of fresh water. The Old Hospital - is a magnificent timber building, originally built in Hope Street in 1879 and was Cooktown’s Hospital until 1986. It was then moved to its current site in May Street and is the Jehovah Witness Kingdom Hall. The Old Bank - this magnificent building was originally the Queensland National Bank built in 1891. The bank fittings are hand-crafted Red Cedar - definitely worth a visit! Nature's Powerhouse – located at the Botanic Gardens and houses the Cooktown Visitor Information Centre. The Vera Scarth-Johnson collection of beautiful botanical illustrations of local flowering plants is also found here. Botanic Gardens – among the oldest in Australia, they were originally established in 1878 and are approximately 2 km from the wharf. An extensive collection of Cape York plant life and an interesting mix of native and exotic plants are on show. Original features include rock pools and stone-pitched walls. Shady pathways through the gardens lead to Finch Bay. The Cemetery and Chinese Shrine - with its oldest grave dating back to 1874. The Chinese Shrine reminds us of the important part played by the Chinese in the early days of settlement. The Powder Magazine Building - was built in 1874 to store explosives. It is thought to be the first brick building constructed on Cape York Peninsula. Interestingly, no nails were used in the building in order to prevent sparks when barrels of gunpowder were being moved. Grassy Hill and the Lighthouse – the superb view from Grassy Hill is a sight not to be missed, especially at sunset. The hill is steep, but accessible by road. Cooktown Historic Railway Park - located at the bottom of Hogg Street, behind the Cooktown Bakery, the railway park displays some of the old railway equipment that was used for the Cooktown - Laura railway line that operated from 1885-1961. View a map of the park here.